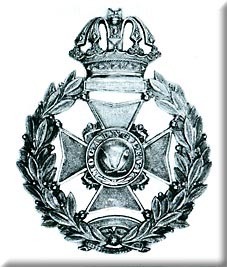 From 1886 a number of units were raised specifically for the service in the newly annexed areas of upper Burma which now came under administration from India. At the same time military district police were raised in both upper and lower Burma. The levies and armed police battalions were recruited from a number of classes, including Punjabis, Hindustanis, Assamese, Manipuris, and Gurkhas. The local tribes were not considered suitable for recruitment. The men, although primarily soldiers, had the power of arrest but almost no knowledge of the military machine with it's concepts of teeth-arms, support corps etc. Later on, the recruiting net was spread wider and included Garhwalis, Sikhs, Rajputs, Karens and other Burmese and Indian frontier hill tribes. Most of the Gurkhas would have been domiciled in Assam or Burma or, it is thought, came from the Kiranti tribes of eastern Nepal - Limbus and Rais. 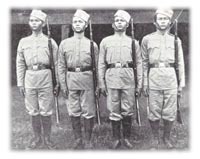 Among the first to be raised in March 1886 was the Mogaung Levy, about 500 strong and recorded as being a Gurkha unit. Mogaung lies west of Myitkyina and the River Irrawaddy. They appear to have been amalgamated with or absorbed into, the Bhamo Military Police Battalion which survived until 1942. There seems to have been Gurkhas in the unit throughout; certainly the strength return of the 1st January 1919 showed it as having 262. The town of Putao lies in the remote north of Burma, not far from the indian border, in what is now Kachin State. The battalion was raised in 1914 and only lasted 6 years, until 1920. Their badge suggests that the unit consisted almost entirely of Gurkhas, as there were over 700 of them in 1919.